Nigeria’s main opposition political party, the People’s Democratic Party (PDP) lost power to the ruling All Progressives Congress (APC) in 2015, after ruling the nation for 16 years. As the 2019 presidential election race gains speed, the PDP has vowed to regain power in 2019, but two major challenges stands in her way. The party must present a credible presidential candidate and defeat incumbent President Muhammadu Buhari at the polls. Thirteen political heavyweights are struggling for PDP’s ticket and efforts to present a consensus candidate proved abortive. The party is on the verge of conducting a presidential primary to elect the one who will confront Buhari. This piece weighs the chance of the candidates and foretells the outcome. 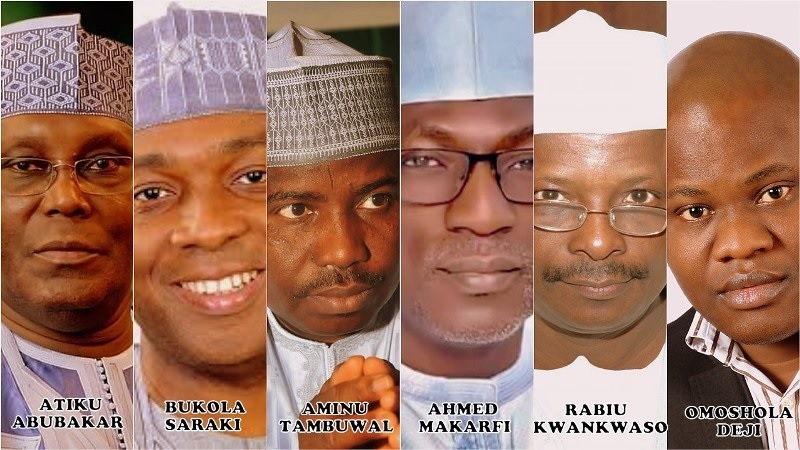 The thirteen aspirants jostling for the PDP presidential ticket are former Vice President Atiku Abubakar, Senate President Bukola Saraki, Governors Aminu Tambuwal and Ibrahim Dakwambo of Sokoto and Gombe States, and ex-Governors Attahiru Bafarawa, Rabiu Kwankwaso, Ahmed Markafi, Jonah Jang, and Sule Lamido of Sokoto, Kano, Kaduna, Plateau and Jigawa states respectively. Others are former Senate President David Mark, former Minister of Special Duties, Taminu Turaki and Stanley Osifo from Edo State. The PDP presidential aspirants are mainly northerners. The party zoned the ticket to the north in order to lessen Buhari’s vote in the region. The two digit number of aspirants struggling for PDP’s ticket is an indication that the party’s umbrella is large and strong enough to manage all manner of persons, burden and character. Except PDP presents a credible candidate to Nigerians, it will be difficult for the party to regain power in 2019. The states with the highest number of registered voters such as Kano and Lagos are being ruled by the APC. PDP is in control of 14 states, including Kwara, Bayelsa, Abia, Gombe, Ekiti, Delta, Ebonyi, Akwa-Ibom, Rivers, Taraba, Cross-Rivers, Enugu, Sokoto and Benue states. The national convention and presidential primary is scheduled to hold in Rivers state. On how the presidential candidate would emerge, PDP’s Electoral Guideline states that “aspirant with the highest number of votes at the end of the voting shall be declared the winner of the primary. The document further states that “each aspirant must be nominated by at least 60 persons from not less than two-thirds of all states of the federation who shall be registered voters in their respective local government areas and also registered members of the party”. The ruling APC has conducted her presidential primary and Buhari returned unopposed. The emergence of Buhari’s candidacy is common among incumbent presidents and governors. Scores of them do everything humanly possible to avoid primaries despite being in control of the party and the state. Competing with them is often considered an affront and such challenger would either be hounded or prevailed upon to step down. Managing the party to ensure there’s no contender and awarding automatic tickets to incumbents is the bedrock of disaffections and defections. This ruined the PDP under the leadership of ex-president Goodluck Jonathan. This also triggered a mass defection from the APC to the PDP recently. Four out of the thirteen PDP presidential aspirants – Saraki, Kwankwaso, Tambuwal and Atiku – are APC defectors. These men would probably not have defected if they are sure of a free and fair presidential primary contest against Buhari. The desire to fulfill their ambition of ruling Nigeria made them dump the APC for the PDP. Some of them know they can’t win, but having the opportunity to test their popularity in a free, and fair primary makes them feel fulfilled. The north-south unconstitutional, but conventional power rotation in Nigeria also pushed most of the presidential hopefuls into the PDP. Northerners nursing presidential ambition would be restricted by zoning if do not try their luck now. The ruling elites have technically zoned the presidency to the north and power is expected to return to the South by 2023. The implication of such is that if the northern aspirants postpone their ambition, remain in the APC, and Buhari earns another term to rule till 2023, virtually all the waiting aspirants may never have the opportunity to become president again. They apparently have to wait till 2031, after the south must have ruled for eight years. By 2031, majority of those currently interested in the nation’s top job would have become old and unfit. Atiku is 71, Lamido is 69, Turaki is 61, and Markafi is 62. If you add 12 years (2019-2031) to the age of all the aspirants, you’ll realize that many of them cannot really afford to wait, especially with the rising advocacy of not too young to run. The either-now-or-never desperation would make the PDP primary a very keen contest. The star-studded race would be very fierce as veteran contestant Atiku Abubakar seems to only have this one last opportunity. Atiku has failed to achieve his presidential ambition on three attempts, but he has remained consistent in his pursuit. He has traversed the country, making consultations and selling his programs to vote-determining groups and individuals, including former and serving governors and legislatures, religious and traditional leaders, business moguls, and the international community. His advocacy for restructuring is also earning him admiration across the country. The major obstacle to Atiku’s candidacy is that many see him as a political migrant that jumps from one party to another. He is also competing with a go-getter like Saraki, younger aspirant Tambuwal, and loyal party man like Dakwambo. Be that as it may, Atiku would get the party ticket, if the delegates top voting criteria is the financial capacity to fund campaigns and preference for someone who is popular across Nigeria. Atiku is virtually the only candidate with no other alternative. Majority of the other aspirants have picked governorship and senatorial forms through surrogates. PDP has been copying APC’s strategy lately. A number of regional political parties merged to form the APC and defeat the PDP in 2015. Adopting a similar strategy, the PDP has aligned with about 40 parties with the sole goal of fielding a joint presidential candidate to defeat the APC in 2019. APC members picked their National Chairman, Adams Oshiomole from the South-South and the PDP did same by going for Uche Secondus. APC presidential candidate, Muhammadu Buhari is from the northwest, will PDP also present a candidate from the region? Most likely. Aspirants from the northwest are Sule Lamido from Jigawa state, Rabiu Kwankwaso from Kano State, Ahmed Markafi from Kaduna State, Aminu Tambuwal and Attahiru Bafarawa from Sokoto State, Taminu Turaki from Kebbi State and Datti Baba-Ahmed from Kaduna state. 7 out of the 13 presidential aspirants are from the northwest. 4 out of the 7 are ex-governors and one is a serving governor. If PDP decides to have a north-west candidate, Kwankwaso, Tambuwal or Markafi will get the ticket. Kwankwaso is the former governor of Kano state which has the highest number of registered voters. He is very influential in the northwest and has a formidable political structure and followers across Nigeria – the Kwankwasiyya Movement. The PDP may offer Kwankwaso the ticket in order to harvest Kano’s massive votes and reduce Buhari’s support base in the victory deciding northwest region. Markafi is a credible alternative for Kwankwaso. If PDP’s top selection criteria is based on party loyalty, Markafi would get the presidential candidate ticket. Markafi is the ex-Caretaker Chairman that wrestled the party from the grip of Ali Modu Sheriff, the former National Chairman. Tambuwal is another credible choice. He is ‘young’ and has one thing other aspirants from the region don’t have: immunity. Incumbent Governors Tambuwal or Dankwambo of Sokoto or Gombe state will get the ticket if PDP considers it essential to safeguard her presidential candidate from political prosecution. Tambuwal and Dakwambo has immunity from arrest and prosecution till their tenure ends on May 29, 2019. This implies that both would be enjoying immunity during the electioneering period and cannot be arrested, detained or prosecuted if they are the PDP presidential candidate. PDP must note that the ruling APC is intolerant of the opposition and any candidate presented would most certainly be invited to answer one charge or the other, in order to decimate him, except such person is protected by constitutional immunity. The Idris Kpotum led police is inefficient in tackling insecurity, but extremely skilled in hounding the real and imaginary oppositions of Buhari and the APC. The near arraignment of the Osun PDP gubernatorial candidate, Senator Ademola Adeleke on the eve of the election and the persecution of Senators Bukola Saraki and Dino Melaye are notable instances. Saraki will be the PDP presidential candidate, if the party is shopping for someone that can combat the APC and their hounding tactics. Saraki has defeated the APC’s effort to decimate him on several occasions. He emerged as Senate President and has occupied the position for over three years without the support of the APC leadership. Recent efforts to remove him when he decamped from the APC to the PDP was also unsuccessful. He was arraigned for false asset declaration and the Supreme Court gave him a clean bill of health. Efforts to embarrass him with alleged complicity in the Ofa bank robbery also proved abortive. Saraki’s triumph against the APC has enriched his political clout and earned him admiration and accolades. His ability to retain majority support in the Senate despite the many troubles shows that he is a seasoned administrator and can keep Nigerians united. Saraki, Atiku, Tambuwal and Kwankwaso are in good position to pick the PDP presidential ticket, but the major hurdle before them is passing the loyalty test. Happenings in the coming days would reveal whether the PDP has forgiven them for the embarrassing defeat their defect caused the party in 2015. Even if the party forgives them, would ex-President Jonathan, who lost power in 2015 ever support their aspirations to become the PDP presidential candidate? Will he support and work hard for the electoral victory of these persons should any one of them become the PDP candidate? David Mark’s political influence has waned tremendously after he lost his Senate President position to Bukola Saraki. Other aspirants like Sule Lamido and Jonah Jang has a weak political outreach and corruption baggage hanging round their neck. PDP’s ticket might eventually be given to one of those who made the party lose election in 2015. If such happens, the loyal aspirants that stood by the party during crisis will be aggrieved. The PDP National Working Committee must have a strong crisis management and post-primary unifying strategy in place. APC is fasting, praying and eagerly waiting to profit from a post-primary crisis in the PDP. Any implosion in the PDP would make Buhari get an easy win in 2019. The PDP delegates and party hierarchy across the states and the national level would be supporting candidates based on their experience, age, party loyalty, nationwide support and integrity. The party delegates would most likely avoid thumbing those standing trial for corruption cases in order not to play into the hands of the APC. Unlike inter-party contests, delegates decision on the candidate to elect changes frequently during intra-party elections, especially in governorship and presidential primaries. A lot of negotiations, alignments and realignments occur few moments to voting and such could alter existing permutations. For the reason that delegates voting intention during party primaries are easily influenced and instable, the pundit too will be flexible. Out of the thirteen aspirants, the pundit will select three that’ll most likely win the primary. From analysis and findings, Aminu Tambuwal may emerge the PDP candidate because he is from the northwest region, he is of a much younger age and he has immunity from prosecution. The immunity makes him a better choice than Kwankwaso. Tambuwal passed majority of the pundit’s measures of assessment; he is therefore ticked as the most capable aspirant PDP can use to defeat Buhari. Atiku Abubakar may win the party’s ticket based on his far-reaching networks, rigorous campaign and financial strength. Saraki may also emerge as the PDP presidential candidate based on his strong rapport with the delegates, especially the legislatures. Nigerians don’t often reward loyalty. If the PDP delegates are rational thinkers, Markafi who has shown unflinching loyalty to the party and managed it successfully under intense political troubles should pick the ticket. He is from the northwest region, experienced and not standing trial. PDP is now a beautiful bride for the aspirants that decamped in 2015 because the party is now stable and formidable. People who defected from the party won’t have returned to seek a presidential ticket if Markafi had not managed it successfully. None of those who abandoned the party during turbulent times worth the presidential ticket. *Omoshola Deji is a political and public affairs analyst.